This section of the Spokane River from Upriver Dam to Monroe Falls Dam is probably most well know due to the popular Spokane Falls and Riverfront Park. Riverfront Park is also the site where the 1974 Worlds Fair took place. Park is a must stop for those wanting to view some of the most beautiful falls in the world and enjoy one of the cleanest cities in the nation. Before the falls there is a section of the river that is popular with kayakers and is considered a class 1 float if even that. There are either 2 or 3 consecutive sets of rapids depending on water level. All of which are only about 1 to 2 miles below the Upriver Dam. No motorized water craft or persons are allowed in any section of river or its falls between Upper River Dam and Monroe Street Dam. Up river of the Upriver Dam there are 6 areas for kayaks/canoes to access to the river. It is a MUST that one float this section of the river ONLY when the river flow is slow, not during spring run off or during very wet times of the year, etc.. This is the first access site for the river between the Upriver Falls Dam and Upriver Dam. One can park in the very small gravel parking lot along N. Upriver Dr. just south before the road Y's with E. Upriver Dr. & E. Frederick Ave. From the road one traverses down a trail to a level and large grassy area. The bank is easy to get down to the river edge. This is an excellent place to fish from but is not suited for swimming due to it's close proximity to the dam. Of course one should be aware that you are immediately below the dam and the spillways can be opened unexpectedly at anytime. Please check the dams notices and information, river flow status, etc. at http://www.avistautilities.com/environment/ourpart/recreation Restrictions: Watercraft with motors are not allowed on the section of the river from Park Road (Park Road is about a mile up river from Upriver Dam and slightly up river from Boulder Beach) to Plese Flats Park. Wearing a Life Jacket is required. Directions: In the city of Spokane take Exit 287 off of I90 and proceed North on N. Argonne Rd. to the intersection of N. Argonne Rd. & E. Upriver Dr. Turn left/west onto E. Upriver Dr. proceed down the road a few miles until you near Upriver Dam. Once past the dam turn left/south onto N. Upriver Dr. Immediately on this road to your left/south you will see a small parking area; this is the place. Maps: Go to google.com/maps and type Spokane, WA, US. On I90 locate Exit 287 and follow above directions to view the park. ACCESSIBILITY: PARKING... Parking along the road is mostly gravel with some paved areas. You must park completely off the road; PATHS/TRAILS... There are dirt trails down to the river, and they are extremely steep at about a 7% grade. Not accessible at all. Total big rocks and boulders to get down to the water; RESTROOMS/FACILITIES… None; SENSORY... No sensory tactile markers for those with visual and other impairments. DOCKS/LAUNCHES/PLATFORMS… None; DIRECT WATER ACCESS… No access for wheeled mobility devices; TRANSFER SYSTEMS... None; CAMPING... None; O.T.H.E.R… Oddities/Barriers: Large rocks and boulders; Terrain: Steep 7% grade to put-in; H2O/Water: Water in the river is normally pretty clear. Water temperature in the summer can be around 60 degrees. Extreme currents and rapids/white water; Environmental Conditions: Extreme currents, fast water, and rapids/white water; Resources: Food, water, and gas in the town. There are several spots to launch from along Upriver Drive. Be careful not to park in an area that is designated NO parking as your vehicle will be towed awau. There are several locations along this road with turnouts to access the bike trail and picnic areas which also can be used for launching and retrieving. There are also a couple of things to be cautious of here... Be careful of sweepers (trees with limbs that hand low over the river) which can potentially (as the term replies) "sweep" you off your craft. One must also be careful to only access the river during slow current times of the year to avoid being taken quickly down the river to the falls. Restrictions: Watercraft with motors are not allowed on this section of the river from Park Road (Park Road is about a mile up river from Upriver Dam and slightly up river from Boulder Beach) to Plese Flats Park. Wearing a Life Jacket is required. Directions: In the city of Spokane take Exit 282 (282A if you driving west from Spokane Valley & Coeur d'Alene) off of I90 and proceed North on N. Hamilton St. to the intersection of N. Hamilton St. & E. Mission Ave. Turn right/east onto E. Mission Ave. and proceed down the road a few miles until you reach E. Upriver Dr. just before the bridge that crosses the Spokane River and next to Mission Park. Once on E. Upriver Dr. (some distance down this road the name changes to N. Upriver Dr. and then turns back into E. Upriver Dr. at the Dam and beyond) watch for various legal access sites along the river. Maps: To view a map go google.com/maps and type Spokane, WA, US. On I90 locate Exit 282 and follow above directions to view the river access sites. ACCESSIBILITY: PARKING... Parking along the road is mostly gravel with some paved area. You must park completely off the road; PATHS/TRAILS... There no real designed trails to the waters edge. Its a very short distance from the road/parking lot to the waters edge. No designated accessible trails to the water; RESTROOMS/FACILITIES… None; SENSORY... No sensory tactile markers for those with visual and other impairments. DOCKS/LAUNCHES/PLATFORMS… None; DIRECT WATER ACCESS… No access for wheeled mobility devices; TRANSFER SYSTEMS... None; CAMPING... None; O.T.H.E.R… Oddities/Barriers: Some areas have large bushes, etc. Some rocks and mud; Terrain: 2 to 5% grade; H2O/Water: Water temperature in the summer can be around 60 degrees. Extreme currents and fast water; Environmental Conditions: See weather reports at weather.com. Temperatures vary; Resources: Food, water, and gas in the town. This site is just before Mission Avenue (north of Mission Ave.) on E. South Riverton Ave. There is room to park, grass to picnic on, and river access. The trees here do hang over the river making launching a little more tricky. It would be better to launch just down the road after crossing Mission Ave. traveling southward. There are no restrooms at this location. Restrictions: Watercraft with motors are not allowed on this section of the river from Park Road (Park Road is about a mile up river from Upriver Dam and slightly up river from Boulder Beach) to Plese Flats Park. Wearing a Life Jacket is required. Directions: In the city of Spokane take Exit 282 (282A if you are driving west from Spokane Valley or Coeur d'Alene) off of I90 and proceed North on N. Hamilton St. to the intersection of N. Hamilton St. & E. Mission Ave. Turn right/east onto E. Mission Ave. proceed down the road a few miles until you reach the bridge that crosses the Spokane River and you will pass Mission Park & public pool facility. After crossing the bridge immediately turn left/north onto E. South Riverton Ave. Immediately to your left you will see a long gravel parking lot with grassy area and lots of trees; this is the place. Maps: To view a map go google.com/maps and type Spokane, WA, US. On I90 locate Exit 282 and follow above directions to view the river access sites. ACCESSIBILITY: PARKING... Parking along the road is mostly gravel with some paved area. You must park completely off the road; PATHS/TRAILS... There no real designed trails to the waters edge. It's a very short distance from the road/parking lot to the waters edge. No designated accessible trails to the water; RESTROOMS/FACILITIES… None; SENSORY... No sensory tactile markers for those with visual and other impairments. DOCKS/LAUNCHES/PLATFORMS… None; DIRECT WATER ACCESS… No access for wheeled mobility devices; TRANSFER SYSTEMS... None; CAMPING... None; O.T.H.E.R… Oddities/Barriers: Some areas have large bushes, etc. Some rocks and mud; Terrain: 2 to 5% grade; H2O/Water: Water temperature in the summer can be around 60 degrees. Extreme currents and fast water; Environmental Conditions: See weather reports at weather.com. Temperatures vary; Resources: Food, drinks, and gas in the town. There are several spots along this road that give access to the river such as this spot between Mission Ave. and the Railroad bridge across from Mission Park. This is not an aesthetically pleasing spot to launch from, but other than the Upriver Dam Put-In sit it is the easiest place to launch from because there are fewer trees and there is a nice gradual grade to the waters edge. There are no restrooms at this location. Restrictions: Watercraft with motors are not allowed on this section of the river from Park Road (Park Road is about a mile up river from Upriver Dam and slightly up river from Boulder Beach) to Plese Flats Park. Wearing a PDF is required. Directions: In the city of Spokane take Exit 282 (282A if you driving west from Spokane Valley & Coeur d'Alene) off of I90 and proceed North on N. Hamilton St. to the intersection of N. Hamilton St. & E. Mission Ave. Turn right/east onto E. Mission Ave. and proceed down the road a few miles until you reach the bridge that crosses the Spokane River and you will pass Mission Park & public pool facility. After crossing the bridge immediately right/south onto N. South Riverton Ave. Stay right; if you go straight you will drive onto N. Helena St. and move away from the river. A short distance down N. South Riverton Ave. before the railroad tracks on your left you will see a un-maintained open area. You will have to park along the road since there is no parking lot there. Maps: To view a map go google.com/maps and type Spokane, WA, US. On I90 locate Exit 282 and follow above directions to view the river access sites. ACCESSIBILITY: PARKING... Parking along the road is mostly gravel with some paved area. You must park completely off the road; PATHS/TRAILS... There no real designed trails to the waters edge. It's a very short distance from the road lot to the waters edge. No designated accessible trails to the water, but it is a nice gradual decent to the water; RESTROOMS/FACILITIES… None; SENSORY... No sensory tactile markers for those with visual and other impairments. DOCKS/LAUNCHES/PLATFORMS… None; DIRECT WATER ACCESS… No access for wheeled mobility devices; TRANSFER SYSTEMS... None; CAMPING... None; O.T.H.E.R… Oddities/Barriers: This areas has bushes, etc. than at other locations near by. Some rocks and mud; Terrain: 2 to 3% grade; H2O/Water: Water temperature in the summer can be around 60 degrees. Extreme currents and fast water; Environmental Conditions: See weather reports at weather.com. Temperatures vary; Resources: Food, drinks, and gas in the town. This access is ONLY accessible to kayaks and canoes. No swimming or wading allowed. Wearing your Life Jacket is required. If you find the Old Spokane River Launch too busy, the SIRTI access site just down the road is an ok alternative. The launch site is steep and a short distance from the green designated parking lot. Extreme caution MUST be followed when launching or retrieving from this site during swift water times of the year and due to its closeness to the Upper Falls Dam. It MUST NEVER be accessed during spring run off. The official no boating and water/river access area is between Division Street bridge and Monroe Street Dam. Anyone who accesses this area will be arrested for endangering him/herself and those that will have to rescue him/her. Restrictions: Watercraft with motors are not allowed on this section of the river from Park Road (Park Road is about a mile up river from Upriver Dam and slightly up river from Boulder Beach) to Plese Flats Park. Wearing a Life Jacket is required. Parking info: The parking lot is large and on the southwest side of the SIRTI building. If you park here during the week you will receive a ticket and possibly get towed. During the weekend you could get a ticket but kayakers tell me the parking lot is not enforced during the weekend. To avoid a possible ticket unload your kayak and then drive to a lot where you can legally park (make sure not to leave your kayak unattended or it WILL be stolen). Directions: In the city of Spokane take Exit 281 (Division Street Exit) off of I90 and proceed North on S. Division Street. S. Division St. turns to N. Division St. when you get to downtown Spokane. On N. Division St. Just before the bridge that crosses the Spokane River you can turn right/east on either E. Spokane Falls Blvd. or E. Olive Ave. Turn left onto E. Riverpoint Blvd. Follow this road Until you see the SIRTI building (sign/letter is placed high near the top of the building and can be hard to see) to your right/southwest and a GREEN designated parking lot. Drive into this lot and proceed to the northeast corner next to the SIRTI building, this is the place. SEE PARKING INSTRUCTIONS ABOVE! Maps: To view a map go google.com/maps and type Spokane, WA, US. On I90 locate Exit 281 and follow above directions to view the river access sites. ACCESSIBILITY: PARKING... Parking in large parking lot. See parking restrictions in above text; PATHS/TRAILS... There no real designed trails to the water's edge. It's extremely steep to the water of 10% grade or more. No designated accessible trails to the water; RESTROOMS/FACILITIES… None; SENSORY... No sensory tactile markers for those with visual and other impairments. DOCKS/LAUNCHES/PLATFORMS… None; DIRECT WATER ACCESS… No access for wheeled mobility devices; TRANSFER SYSTEMS... None; CAMPING... None; O.T.H.E.R… Oddities/Barriers: Large bushes, Steep grade to water, large rocks and boulders, etc. ; Terrain: 10% plus grade; H2O/Water: Water temperature in the summer can be around 60 degrees. Extreme currents and fast water; Environmental Conditions: See weather reports at weather.com. Temperatures vary; Resources: Food, drinks, and gas in the town. No swimming or wading allowed. Wearing your Life Jacket is required. This launch is in front of Riverpoint Village Condominiums (ONLY accessible to kayaks and canoes). No swimming or wading allowed. Wearing your Like Jacket is required. This is a great lesser known launch site just up river from the busy Division Street Bridge (see below... $7). Extreme caution must be used when launching or retrieving from this site during swift water times of the year (due to its close proximity to the Upper Falls Dam). It MUST NEVER be accessed during spring runoff. The official no boating and water/river access area is between Division Street bridge and Monroe Street Dam. Anyone who accesses this area will be arrested for endangering him/herself and those that will have to rescue him/her. This site is the original location of an old Spokane boat launch before this area was developed; in the old days people would launch their small powerboats and now powered water craft here. Restrictions: Watercraft with motors are not allowed on this section of the river from Park Road (Park Road is about a mile up river from Upriver Dam and slightly up river from Boulder Beach) to Plese Flats Park. Wearing a Life Jacket is required. Parking info: This site can only be accessed via the Washington State University (WSU) yellow designated parking lot across from the WSU Library building and next to the Riverpoint Village Condominiums via the Centennial Trail. The site to launch from is directly in front of the Riverpoint Village condominiums off of the Centennial trail. The land is owned by the city and not by the condo owners. The area around the launch site is shallow, particularly during July and late summer. The river channel during the low water times of the year is approximately 5 feet deep near the middle of the river. More Parking Info: The parking lot is large. If you park there during the week when college is in session you will receive a ticket and possibly get towed. During the weekend you could get a ticket but kayakers tell me the parking lot is not enforced during the weekend. To avoid a possible ticket unload your kayak and then drive to a lot where you can legally park (make sure not to leave your kayak unattended when moving your vehicle to park or your kayak WILL probably be stolen). Directions: In the city of Spokane take Exit 281 (Division Street Exit) off of I90 and proceed North on S. Division Street. S. Division St. turns to N. Division St. when you get to downtown Spokane. On N. Division St. just before the bridge that crosses the Spokane River, you can turn right/east on either E. Spokane Falls Blvd. or E. Olive Ave. Turn left onto E. Riverpoint Blvd. Follow this road until you see the WSU Library to your right/south and a YELLOW designated parking lot. Drive into this lot and proceed to the northeast corner next to the Riverpoint Village Condominiums and Centennial Trail; this is the place. SEE PARKING INSTRUCTIONS ABOVE! Maps: To view a map go google.com/maps and type Spokane, WA, US. On I90 locate Exit 282 and follow above directions to view the river access sites. ACCESSIBILITY: PARKING... Parking in large parking lot. See parking restrictions in above text; PATHS/TRAILS... There is a large paved path/trail to the launch location, which is the bike/pedestrian trail called the Centennial Trail, no more than about a 2% grade. This trail does not take one directly to the water's edge, but close to it. Once you get to the launch site get off the trail quickly as to not cause any bike related accidents. There is a short bumpy path to the water of about 2-3% grade. During late summer there is a large sandbar, primarily made up of small pebbles and sand; RESTROOMS/FACILITIES… None at this site but there is within Riverfront Park a mile or so west off of the Centennial Trail; SENSORY... No sensory tactile markers for those with visual and other impairments. DOCKS/LAUNCHES/PLATFORMS… None; DIRECT WATER ACCESS… No access for wheeled mobility devices. At this site one using a wheelchair with assistance can get to the water; TRANSFER SYSTEMS... None; CAMPING... None; O.T.H.E.R… Oddities/Barriers: Large bushes, Steep grade to water, large rocks and boulders, etc. ; Terrain: 10% plus grade; H2O/Water: Water temperature in the summer can be around 60 degrees. Extreme currents and fast water; Environmental Conditions: See weather reports at weather.com. Temperatures vary; Resources: Food, drinks, and gas in the town. No swimming or wading allowed. Wearing your Lifejacket is required. This is the newest launch on the Spokane River right in the hart of the city under the Division Street Bridge on the south side of the river. It is a gravel six foot wide gentle sloping launch legal only to users of non motorized water craft. Also non human power crafts such as float tubes and rafts (no matter their size) are allowed to launch at this site due to the close proximity to the dam just below this site. You must have the ability to paddle, etc. to move up river from this site. There are no rapids or strong current here when the water is slow moving during the hot summers, but if we have a wet summer or lots of run off then the currents and wave action on this part of the river will vary greatly. Parking is limited near the site and all parking includes fees… see parking info below. This is a very busy landing in the summer so for another option see the lesser known site #6 above, the Old Spokane River Launch, which is in our view a far better put-in/take-out site than this Division Street site. No swimming or wading allowed. Wearing your Life Jacket is required. This is the closest access site to the Upper Falls Dam and Riverside State Park. Extreme caution must be used when launching or retrieving from this site during swift water times of the year (due to its close proximity to the Upper Falls Dam). It MUST NEVER be accessed during spring runoff. 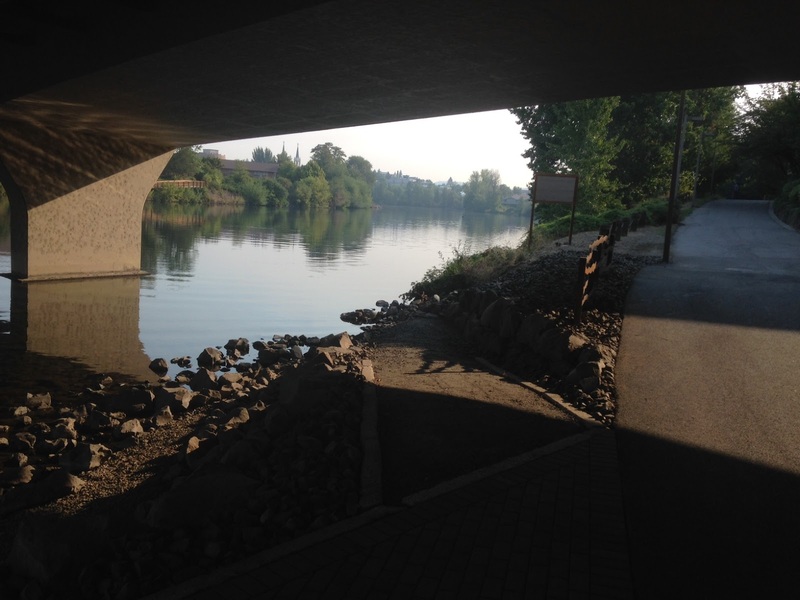 The official no boating and water/river access area is between Division Street bridge and Monroe Street Dam. Anyone who accesses this area will be arrested for endangering him/herself and those that will have to rescue him/her. Restrictions: Watercraft WITH MOTORS are not allowed on this section of the river from Park Road (Park Road is about a mile up river from Upriver Dam and slightly up river from Boulder Beach) to Plese Flats Park (about 10 miles up river from this launch). Wearing a Life Jacket is required. The land this launch is owned by the city. The area around the launch site is shallow in the summer but there or deep drop offs as you progress out into the center of the river, particularly during July and late summer. The river channel during the low water times of the year is approximately 5 feet deep near the middle of the river. Parking info: To unload or load your watercraft drive to the Marriot Hotel parking lot (hotel officials are ok with this but you must not park in their lot for long periods… just for unloading and loading), which is near the launch. Then you must navigate several set of stairs to get to and from the launch. To get around the stairs, for example if you are using a wheelchair for mobility, go to the front of motel to access the Centennial Trail to the launch. There are several parking lots close by (see google map) and all have fees. There is parking under the Convention Center (6.6 ft clearance) and near by at many Diamond parking areas. There is also parking on E. Spokane Falls Blvd just a block south of Marriott Hotel parking lot. There is free one hour parking in front of the Marriot Hotel on E. Olive Way. Make sure not to leave your kayak unattended when moving your vehicle to park as it WILL probably get stolen. If you want to park for free you will have to drive a couple miles (have your companion stay with your watercraft) on E Spokane Falls Blvd, across the bridge and next to the Patterson Baseball Field (probably will not be long before they stick meters on that street as well). As most will protest it's pretty difficult to park for free in Spokane. Directions: In the city of Spokane take Exit 281 (Division Street Exit) off of I90 and proceed North on S. Division Street. S. Division St. turns to N. Division St. when you get to downtown Spokane. On N. Division St. just before the bridge that crosses the Spokane River, you can turn right/east on either E. Olive Ave. Turn left into the Marriot Hotel parking lot, proceed to the Northwest Corner of the parking lot to unload or load your water craft. SEE PARKING INSTRUCTIONS ABOVE! Maps: To view a map go google.com/maps and type Spokane, WA, US. On I90 locate Exit 282 and follow above directions to view the river access sites. ACCESSIBILITY: PARKING... Parking in large parking lot. See parking restrictions in above text; PATHS/TRAILS... No matter where you park to access this site is via bike/pedestrian trail called the Centennial Trail, no more than about a 2% grade. Off of this trail is the gravel launch, with about a 3% grade. See parking info above to avoid starts and other barriers in accessing this site; RESTROOMS/FACILITIES… None at this site but there is within Riverfront Park a half mile or so west off of the Centennial Trail; SENSORY... No sensory tactile markers for those with visual and other impairments. No person with a visual disability should launch and recreate at this location without a sight person with them to ensure one does not get to close to the dam, etc. DOCKS/LAUNCHES/PLATFORMS… None; DIRECT WATER ACCESS… This launch is not paved but some mobility devices with large knobby tires could potentially access the water here Assitance like would be needed. Extreme caution should be applied due to the close proximity to the dam. This is not a swim location. Non-motorized watercraft use only; TRANSFER SYSTEMS... None; CAMPING... None; O.T.H.E.R… Oddities/Barriers: Gravel launch may be difficult to traverse, etc. ; Terrain: 2-3% grade; H2O/Water: Water temperature in the summer can be around 60 degrees. Extreme currents and fast water, Caution close proximity to Dam; Environmental Conditions: See weather reports at weather.com. Temperatures vary; Resources: Food, drinks, and gas in the town.